Below is a "guide" which covers abbreviations for and explanations about style names that we use (such as advance, reissue, etc). 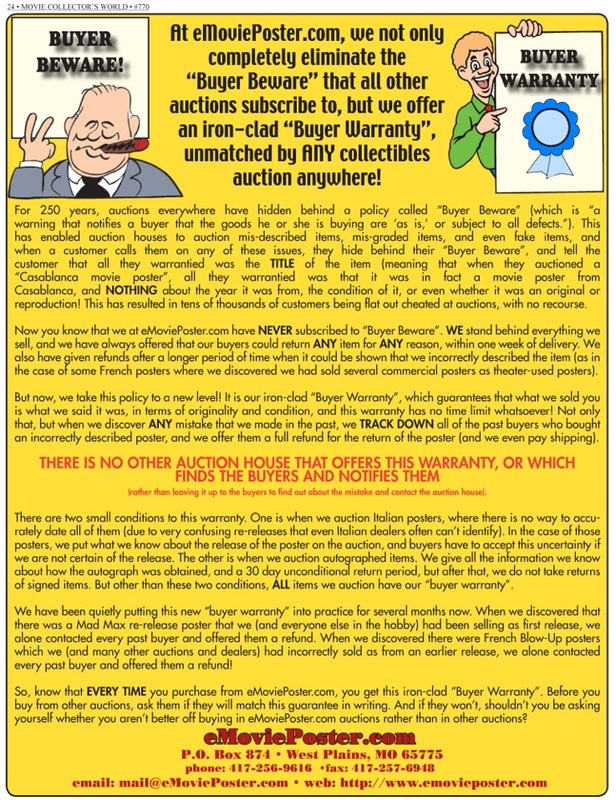 It is not absolutely comprehensive, as there are MANY different designations for different sizes, so if you see any codes in our Auction History that are NOT covered by the below guide, please let us know and we will get them added to this chart. Style A; Style B; A; B; Vader style; soundtrack style; teaser; advance; other similar designations! 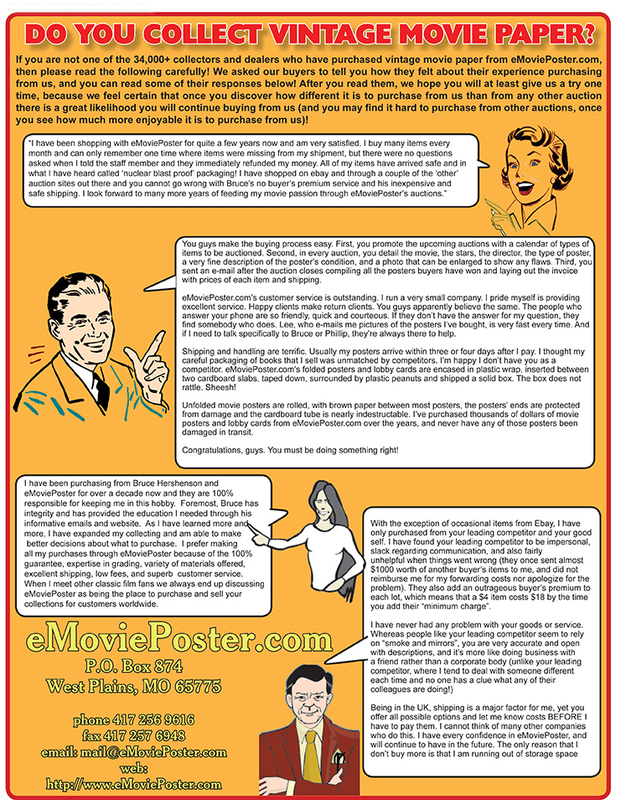 - Often movie paper will have "style A" or "style B" (or simply "A" or "B") or some other designation printed on it (either stamped on the back or printed on the front in the bottom border) indicating which version of the poster it is, when more than one version was created. We always write this "official" style in our notes, but sometimes studios create more than one style of poster and there is NO designation indicated. In those cases, we pick a descriptive name such as "Vader style" or "bike & moon style" or "white style" and "black style" to help collectors know which version of that poster was sold. 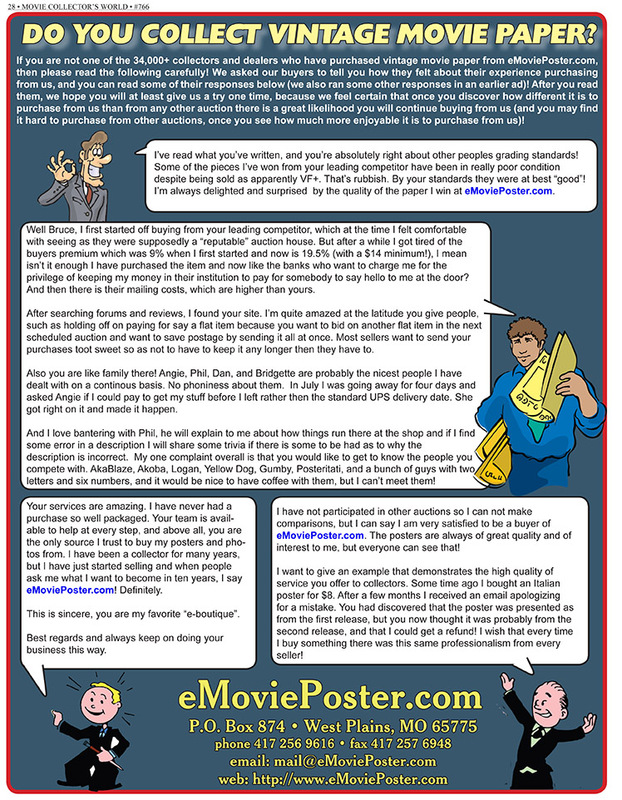 An Advance is a poster made to advertise the film before it is released. Until the 1990s, advance posters were almost always far more rare than "regular style" posters, but by the 1990s, advances have increasingly become the standard (likely studios saw no reason to issue new posters solely to remove the printed start date from them). A Teaser is also an advance poster (made to advertise the film before it is released), but it is one where no (or virtually no) credits are listed on the poster and often it is a single large image, one that is not used on the later "regular poster". Because of the minimal text printed on them, they are often more sought after by collectors. For movies studios believe will be major releases, there may be several different teasers issued such as in the case of Space Jam and many other films. NOTE THAT IN SOME CASES THE POSTER WILL HAVE A PRINTED DESIGNATION AT THE BOTTOM (like "advance teaser") AND WHEN THIS HAPPENS WE ALWAYS NOTE THIS, EVEN IF IT IS NOT CONSISTENT WITH OUR USUAL DEFINITION OF THOSE TERMS! Int'l indicates an "international style" poster meaning it was printed in the U.S. for use in non-U.S. countries. FOR or FOREIGN indicates that wording is physically printed or stamped onto the poster and indicates an "international style" poster. DOM or DOMESTIC indicates that wording is physically printed or stamped onto the poster and indicates a poster used domestically in the U.S.
ALSO, SOMETIMES STUDIOS WOULD DISTRIBUTE THEIR POSTERS DOMESTICALLY BOTH THROUGH THE N.S.S. AND ALSO DIRECTLY, so there will be two versions with ratings, and one will have N.S.S. numbers and the other will not, we distinguish these by referring to them as "N.S.S. style" and as "studio style". military We refer to a poster as being "military" if it was specifically made for showings of movies on U.S. military installations, both domestically and overseas (this was done to a massive extent in both the Korean War and the Vietnam War). Often, these posters were printed in only 2 colors and in a moire (dot) pattern, resembling an enlarged pressbook ad, which they likely were, because the soldiers were a "captive" audience, so they didn't need great posters for these showings! These military posters were usually printed at the same time as the regular U.S. one-sheets when the movie was first released (there ARE re-releases, but these almost always say "re-release" on them). Sometimes the poster has small writing at the bottom that says "For Distribution and Use at U.S. Military Establishments Only", and sometimes they just have "Litho in U.S.A." or "Printed in U.S.A." in small letters in the lower right. Those with "Litho in U.S.A." are almost all from the 1950s and were used in the Korean War, and those with "Printed in U.S.A." are almost all from the 1960s and were used in the Vietnam War. DS means the poster is double-sided (it has a mirror image of the front printed on the back for use in lightboxes in front of theaters). Double-sided posters began around 1986. The one thought to be the first ever is for Little Shop of Horrors. Sometimes we may specify "SS" which means the poster is single-sided. This is only done where we have both a single-sided AND a double-sided version of the same poster, to distinguish between the two. WHEN WE ONLY HAVE ONE OF A STYLE, WE NOTE "DS" IF IT IS DOUBLE-SIDED AND DO NOT PUT ANY DESIGNATION IF IT IS SINGLE-SIDED. R## (such as R81, R40s, R02, etc.) - The "R" indicates that the item is from a reissue (or re-release) of a movie (when it was given a new theatrical release) and the numbers indicate what year. Examples: R81 = 1981 re-release, R40s = undated (probably 1940s) re-release, R02 = 2002 re-release, etc. A reissue is when a film was re-released to theaters years after its first release. For example, The Exorcist was first released in 1974 but it was sent back to theaters again in 1979 and yet again in 2000. In the days prior to television, most movies (good and bad) were given a second release after seven years or so (or when one of the stars achieved greater popularity, etc), and great movies (and all Disney movies) were again re-released each additional seven years, because before TV, there was no other way to again see an old movie. But TV slowly killed off the re-release market, and now it is slowly limited to blockbusters, which is sad, because while it is great to have access to almost all old movies, watching them on a tiny screen does not really compare to seeing them on a really big screen! linen or linenbacked - Means the item was professionally linenbacked. pback, pbacked, or paperbacked - Means the item was professionally paperbacked. Learn more about professional restoration. TC indicates it is title lobby card which is a card that has a most poster-like design (whereas scene lobby cards have a photographic image from the film). Most title lobby cards would have the exact same image as the "Style A" half-sheet, and many title cards have a tiny "T/A" in the bottom right, meaning that image was used on both (the "Style B" half-sheet would often have an image found on NO other posters, which often makes them far more desirable to collectors). +or- - These items were sold from our oldest semi-annual sales catalogs, and the prices listed are the prices that were listed in the catalogs. Because of the way items were sold, some items may have sold for more or less than the listed prices, but every item actually sold for somewhere near that price (unsold items were deleted). To give you more detail, I sent out the catalogs to around 2,000 people, and each one had around $200,000 of material in it, with every item having a listed price, and a black and white image of every item. Each catalog would have around 1,000 to 2,000 items, and many were 100 or more pages (each had two sections, one with the listings, and the other with the photos). 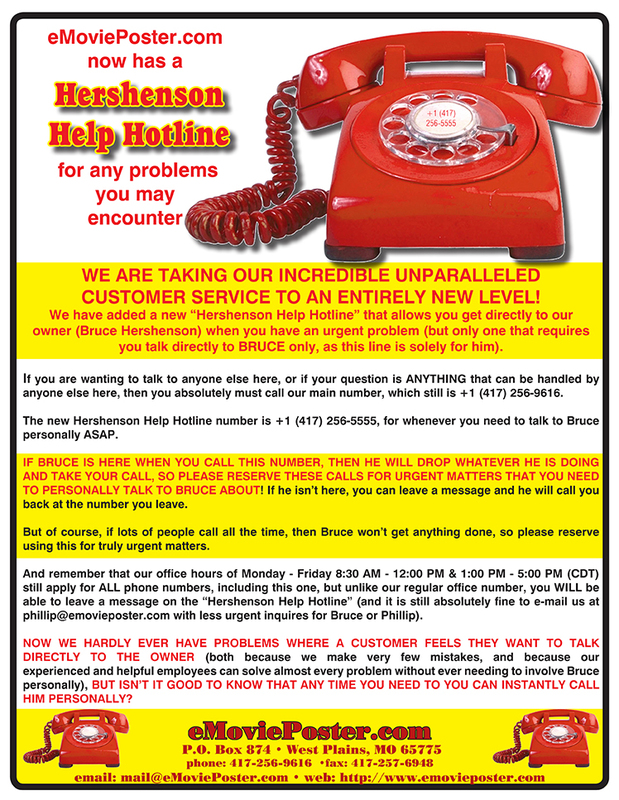 There was a set day and time when you could begin ordering by phone (like Monday September 22nd, at 10 AM). You COULD order anything you wanted the moment you got the catalog in the mail, but ONLY if you paid one and a half times the listed price! Otherwise, you had to wait until the exact time for ordering. I would leave the phone off the hook until that time, and then I would put it back on, and hundreds of people would be trying to call at once, and I would answer whomever was the lucky first person, and take their order (they could have as many items as they wanted for the listed prices). When the first person was done I put the phone down and there would be another person on the line, and I would take their order, and I would continue doing that for around 8 solid hours (and of course many people would ask for the exact same items). The next day we would collate the orders received (usually 100 or so that first day) and then the next day we would give 25% off on whatever was left, and then the next day we would give 50% off on whatever was left, and by that point 99% of the items were gone! Of course this was made massively harder in those pre-computer days, and we did most of this by hand. Everyone in the hobby looked forward to these events held two to four times a year. NOW BACK TO WHY THE "+or-"! It would have taken FOREVER to go back and find exactly which items sold for the listed prices, which sold for one and a half times, and which sold for 25% off and 50% off. So instead, I just transcribed all the listed prices, and put "+or-" after them. "folded", "tri-folded", "unfolded", and "wavy tri-fold" - These are all terms used to describe whether and how a poster is folded. Unfolded means the poster was never folded. Folded means that the poster was folded in the usual way for that size. Tri-Folded means it was folded without a vertical fold. NOTE: For larger posters such as three-sheets, typically only one vertical fold was omitted. Wavy tri-fold is a term we use to describe posters that appear to be tri-folded but where the folds aren't "hard". This is mostly used for Japanese posters. 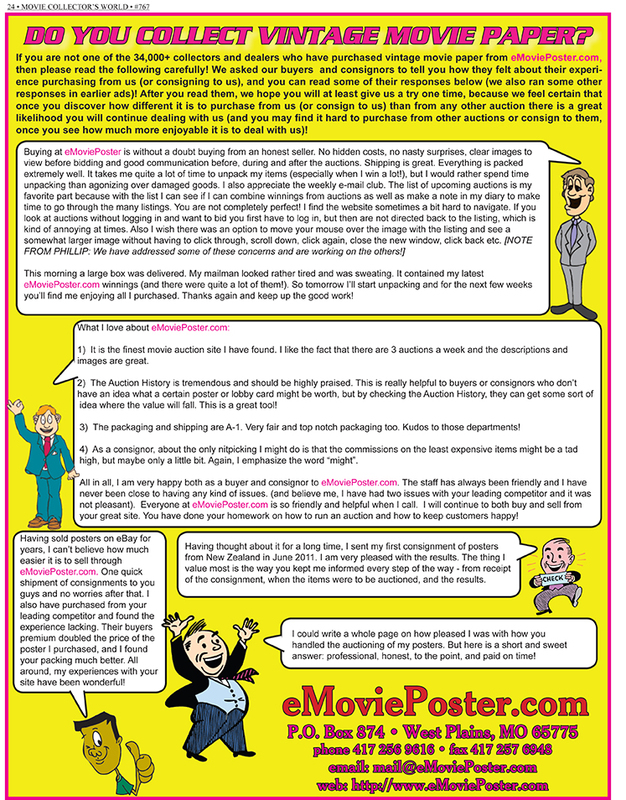 Learn More about how posters were issued. If you have a question about any of the designations used in our Auction History that are NOT covered by the above guide, please let us know which ones they are and we will get them added to this chart.